Sending out promotional text messages helps you bring more customers to your store. It's an efficient way of letting your customer know regarding the latest sales and special offers going on in your store. You are able to select specific carriers that hold customers and send a promotional message with a cost of 2¢ per message. 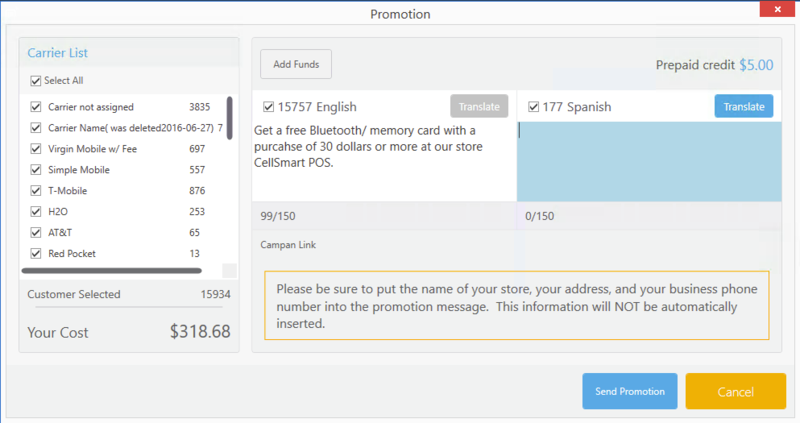 Having the advantage of translating English to Spanish in your message allows you to broaden your promotion range and send promotions to all of your customers despite the language they speak. For any carrier/company that has an ongoing promotion, you can specifically send out your promotion to only the customers with the said carrier/company. Click on send promotion icon from the icon menu. Click on the blue plus (+) icon located at the bottom right corner. Select Plan promotion and the promotion window will open up. Under carrier list, select the carriers/customers you want to send the promotion to, otherwise check select all, you also have the ability to send it to all the customers on your customer list even if they never made a bill payment with you by checking the box against carrier not assigned. Your total customer count & cost will be shown at the bottom left. Under promotion message, type in the message you want to write in the promotion. Consider entering your Store name, address and contact number before typing the message due to the 150 character count limit on each promotion. As you type, the software will tell you the character count. To translate the message into Spanish click on the translate button in blue. Click on the send promotion button to send your promotion. Since using this feature will have a cost to it, you can avail prepaid credit. Click on the add funds button and type in the amount you wish to add. The amount will be charged from the credit card we have from you on the file. While sending out a promotion makes sure you keep it to 150 characters to be able to send it. While typing the promotional message try to do the following, goes a long way with the customer. Try to use the word “Free” whenever possible. Try to use the words “Limited time offer” or “act now”. Try to use the words “Special Offer” or “Only for you”.